The Governor of Hadramout, Commander of the Second Military Region, Maj. Gen. Faraj Salmeen Al-Bahssani, received today a delegation of UN organizations headed by Director of the United Nations Office for the Coordination of Humanitarian Affairs (OCHA), Sebastian Trev, and Deputy Director of the World Food Program in Yemen Mr. Ali Reda. Members of the delegation presented to the governor a picture of the results of their tour of the coast of Hadramout and their visits to a number of service facilities and to inform them of the reality closely. 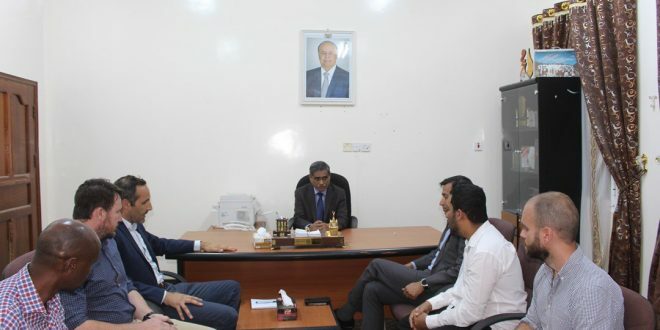 The delegation said that their visit to Hadramout comes with the aim of arranging for the opening of offices of the United Nations organizations in Mukalla to provide assistance to the humanitarian and service sides of the citizens in Hadramout governorate and the eastern governorates, and what they saw of security stability and cooperation by the local authority and related parties and citizens will prompt them to accelerate the opening of offices of UN organizations United Nations in Hadramout.